When planning for hot and dry condition planting, succulents are often among the top candidates because of their ability to withstand prolonged periods of drought. On the other when it comes to planning for winter interests, seldom do they ever get recommended. This could be because of an unspoken assumption that when a plant is heat tolerant, it does not like the cold. This assumption is not valid. Like all gardeners who have grown some of them, I can say that with the appropriate variety and suitable location in the garden, succulents can be among the few interesting plants in the dead of the winter. While the rest of the traditional plants go into dormancy, some succulents continue to grow changing their colors in response to the temperature and light intensity. 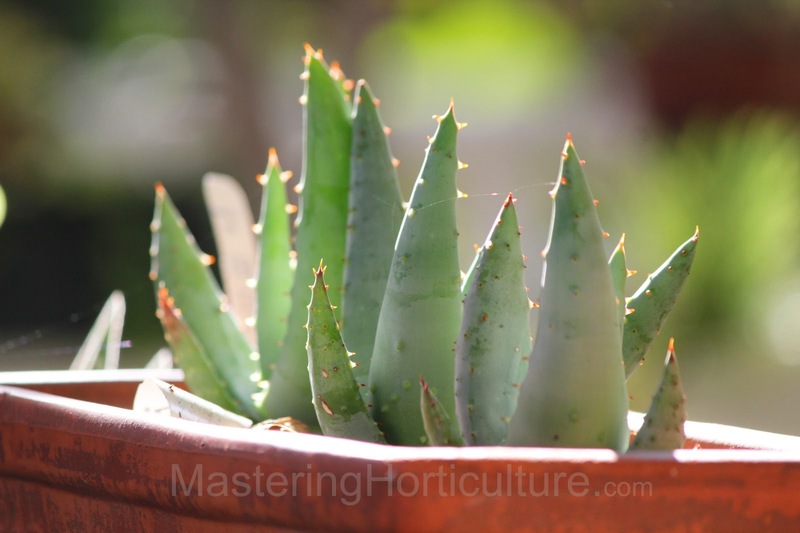 Succulents cover a wide range of plant species that originated from places of varied climes. Some have come from the tropics (rain might be prevalent but some succulents grow on trees where the roots cannot reach the ground); arid regions (deserts have low rainfall and high temperatures that limit water supply); coastal areas (water may be available but it is usually loaded with high levels of salts and minerals - beyond the threshold levels for most plants); and the alps (precipitation may come fresh in relatively larger quantities but it is frozen and unavailable for plant consumption). With that in mind, it is not surprising that some succulents respond differently under varied environmental conditions. And that is why, some succulents can be winter gems even in temperate areas. Succulents is the collective term for drought-tolerant plants with the characteristic thickened fleshy organs (leaves, stems, or roots). Whether the plants evolved (over the years) to come up with this type of specialized fleshy tissues as survival mechanism or whether they were originally endowed with such characteristics the first time they sprouted in the Garden of Eden, I am not sure. However, if such character traits of succulents allow them to survive the extreme dry conditions, how much more would they favor the plants that are grown in gardens where almost everything is manipulated to provide favorable conditions for the plants? California is known for its generally mild climates but my garden - being in the foothills of the Sierras - experiences both ends of the thermal spectrum. We have very hot summers and freezing winters. Over the years I have observed that only few of the succulents in my collection are susceptible to the cold. In fact most of them are very resilient and they display very interesting colors during the colder months. 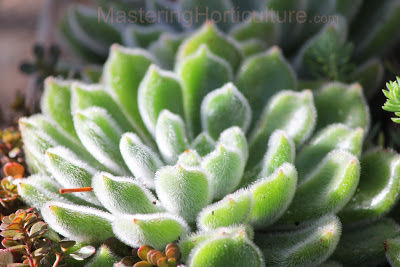 Aeoniums, Sempervivums, Aloes, and Sedums are among the ones that consistently do well in my garden. 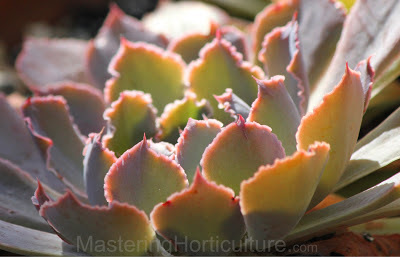 Others like Echeveria also do well depending on variety and microclimate. The earlier they get the morning sun, the better - as this would shorten their exposure to freezing temperatures. Although succulents prefer some amount of shade in the summer, plants that are placed on the south-facing side of the garden have a better chance of withstanding the harsh winter nights. With the right variety and microclimate, succulents can be the garden gem that sparkles in the winter. Fig.1 Streptocarpus flowers intermittently throughout the year. 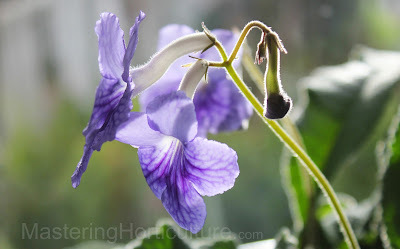 It's been two and half years ago since I first saw a Streptocarpus in full bloom and the plant was not mine. This time I have a clone of that same plant which has been growing in my kitchen. Streptocarpus is probably one of the most beautiful flowering houseplants. It is regarded in high esteem by plant enthusiasts not only because of its pleasing beauty but also because of its durability as a plant. It is an evergreen, herbaceous plant that grows well in shade - making it a great indoor plant. This stemless plant blooms almost throughout the year as long as it is regularly fed with complete fertilizer (preferably with a high phosphorous content). They are related to the African violets but have a different morphological structure that makes them more appealing than their shorter relatives. Fig. 2 Flower buds originating from the petiole of a leaf. 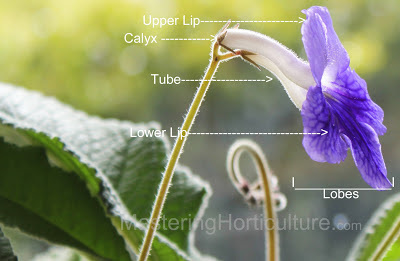 One of the most interesting observations on Streptocarpus is that flower buds originate from the basal section of the leaves (Fig. 2). That's right; the flowers emerge from the leaves. The first flower bud always grows closest to the axil as seen on the picture above. The flowers come in clusters and indeterminately arranged on long slender peduncles that extend well above the top of the leaves giving the appearance of floating flowers (Fig. 3 and Fig. 1). The flowers open in succession which allows a prolonged flower show (Fig. 1 and 5). Fig. 3. Clusters of unopened flowers. Fig. 4 Delicate tubular flower on slender peduncle. The flowers come with a delicate tubular corolla which extends out into deeply scalloped lips that resemble individual petals (Fig. 4). The tube of the flower is usually clear white with increasing pigmentation towards the lobes with the lower lips being darker than the upper lips. The peduncle (stem-like structure that supports the inflorescence) starts out curled and slowly uncurls as it elongates to display the ethereal inflorescence (Fig. 4). 1. Provide sufficient moisture but not soggy soil. Over watering is a common cause of damage on the plant. Water only when the top of the soil feels dry. 2. Position plants in light but not direct sunlight. East facing window sills work best. Putting plants on a hot sunny window sill will cause burning on the leaves. 3. Feed regularly. Fertilize during watering using low fertilizer concentration (about 25% of recommended rate). 4. Allow sufficient room to grow. Divide or re-pot only when the pot is full of roots to the next size using peat-based multi-purpose media. 5. Deadhead regularly. Remove spent flowers (including dead leaves) to encourage continued flowering and to avoid Botrytis (Gray Mold) infection. 6. Monitor the occurrence of pests. Regularly inspect plants for white and greenflies, aphids, mildew, and mealy bugs. (These pests can be a problem but so far I have not seen them on my plants.) It is easier to control pests at the early stage of infestation. 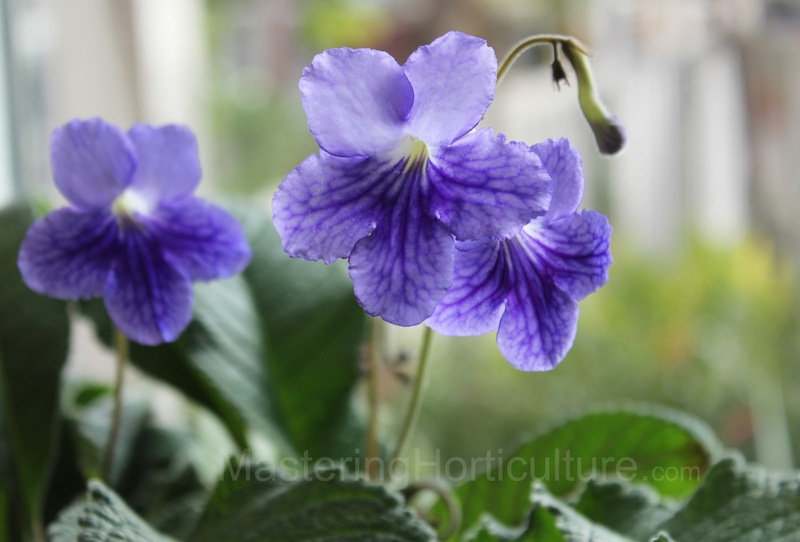 Streptocarpus: a sturdy and delightful flowering houseplant.